Sylvie and Carl have been friends since they were small, eating in each other’s homes, playing childhood games of weddings and being together forever, creating a fantasy Glassworld where only they can go. But now they are older, and though Sylvie’s feelings for Carl are changing from childhood adoration to the beginnings of a more sexual kind of love, he seems to be moving away from her. For the first time, they are separated and Carl often talks about Tom, the sporting hero at his all-boys grammar school, whilst quiet, small Sylvie, almost 14, is surprised to find that the gorgeous Miranda wants to take her under her wing. 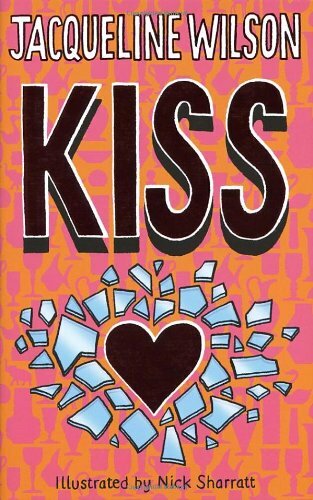 Like the ‘Girls’ series, Kiss is aimed at a slightly older audience and covers some of this writer’s familiar themes: unlikely friends choosing each other for what they lack in themselves, gender identity issues and bullies who are brutal about difference because it is too painful to recognise the same qualities in themselves. Miranda needs Sylvie for her intelligent and sensible grasp of life and Sylvie is attracted to Miranda because of her risk taking and her (apparent) sexual confidence. But the centre of the story is Sylvie and Carl’s relationship and the sophisticated reader will realise long before Sylvie does, that Carl’s feelings for Tom are the real reason why the kind of kiss she longs for will never come her way. One of Jacqueline Wilson’s many strengths as a writer is the tightness of her writing, her economies of scale, but this story seemed to take quite a long time to get to the place it needs to be. When it does get there, the depiction of the casual, brutal homophobia of some adolescent boys, their pack mentality, is painfully honest. With the support of Sylvie and his family, the reader knows that Carl will get through this but there is no suggestion that it will be particularly easy.